Wild Apricot sites have numerous self-service options for members and contacts. Most of these options are available from their member or contact profile. Members and contacts can access their profile by logging in to their Wild Apricot site. or as a View profile link. With some themes, members need to click an icon before viewing one of those options. You can embed a Wild Apricot member profile login box into another website using widgets. 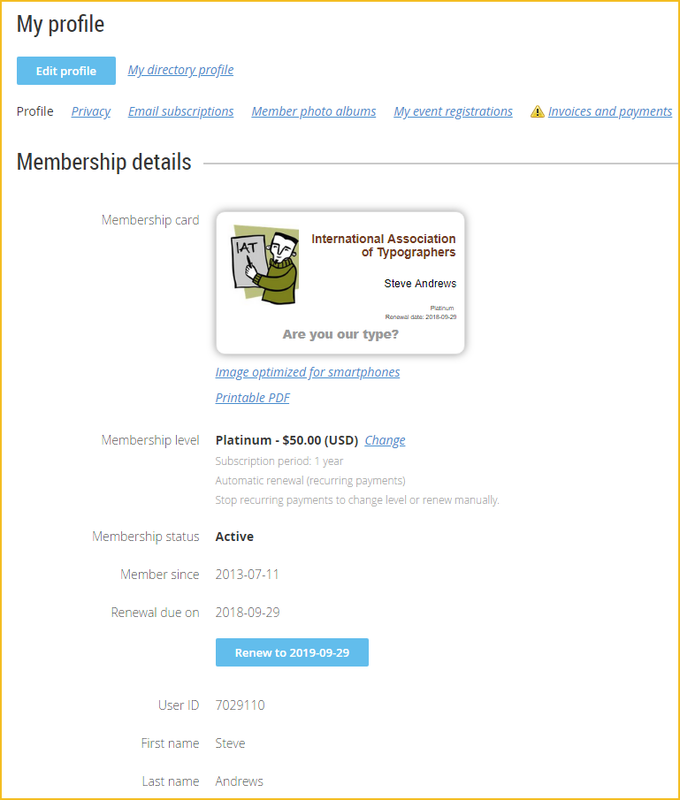 After clicking the View profile link, the user will see their membership details and contact information. To update their profile, they can click the Edit profile button. Depending on how your database fields are set up, members might be able to update files uploaded by themselves or by administrators. For ideas on ways you can use file uploading to benefit your organization, click here. To save their changes, members click the Save button. You can customize this page by modifying the Contact profile system page. 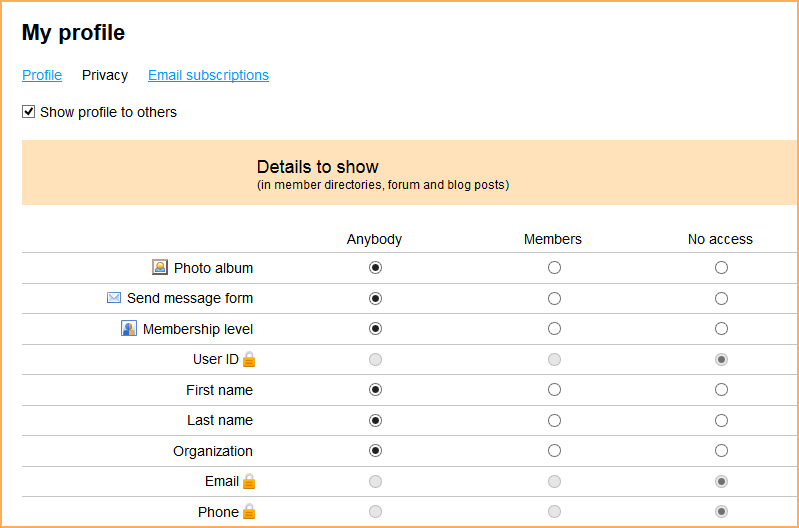 The Email subscriptions page allows members to adjust their email preferences. For more information, see Member - emails settings. Following the Invoices and payments link allows members to view their history of invoices and payments, and pay open invoices. For more information, see Paying invoices. The Privacy link allows a member to specify which fields are visible to everyone, other members, or hidden from everyone else. These settings apply to their listing in the member directory and on their directory profile page. If a lock icon appears beside a field, the member cannot change the privacy setting for that field. For information on locking privacy settings, see Member privacy settings. Administrators can customize the appearance of public profile pages by modifying the Member public profile system page. Clicking the Member photo albums link allows a member to manage their photo albums. For more information, see Member photo albums.